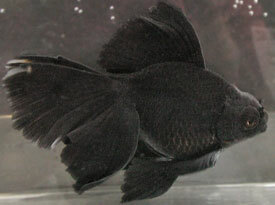 The broadtail moor is, in effect, a jet black veiltail with spherical protruding eyes. Far Eastern imports generally have good eyes and colouration but a somewhat 'rectangular' body outline and a thin-lobed, deeply-forked tail. Breeding for the broad tail seems to result in smaller eyes and a bronze or silver belly, and it is a challenge to prevent the deviation of these characters from the standard whilst improving the tail. This fish is more common in the Northern societies than in BAS. 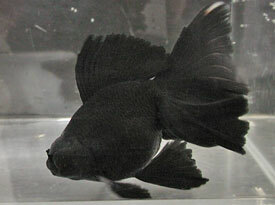 In the Far east, the moor is called the black dragon eye or the black peony. Caudal fin to be divided, well spread held below the horizontal with the trailing edge having no apparent fork or pointed lobes. The minimum length of caudal fin should ideally be 75% of body length. 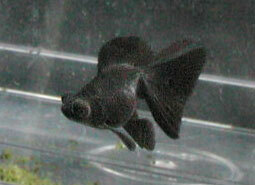 Dorsal fin to be single, all other fins paired and their extremities having a slightly rounded appearance. Eyes to project outwards and slightly forward from surface of head. 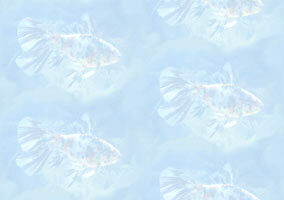 The fish should be bright and alert.The body should be short and rounded with a smooth outline. 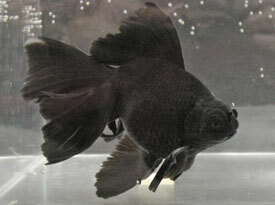 The dorsal fin should be carried high and erect, with the caudal fin well divided and flowing gracefully. The eyes should be prominent with good development and well matched. Note: these eyes are not the same as the Globe-eye; they should be spherical not truncated cones. The colour should be metallic deep black only without a trace of brown or silver. 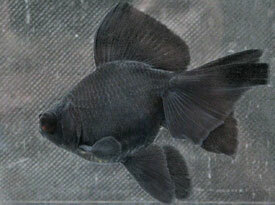 Quality fish will have high colour intensity extending into the fins giving a velvety appearance. 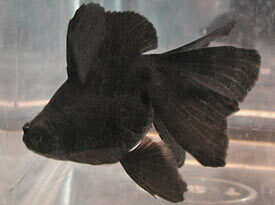 These fish have a good overall matt black colour; the deep, round body has yet to develop, but the heavy, drooping veil tail is already apparent and will grow larger with age. The fish on the left has small patches of uncoloured finnage; ideally the whole fish should be matt black. Shown at BAS 2007 (left), BAS 2009 (right) and BAS 2003 (top). 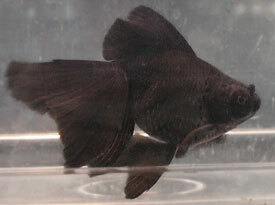 Fine, adult fish with solid black colouration but slightly small eyes. Shown at BAS 2006 (the fish on the left is slightly out of focus - as many have found, it seems to be difficult to get a digital camera to focus on a matt black fish, especially against a dark background). Very good adult fish overall, but with a few patches of uncoloured finnage, somewhat triangular pelvic fins and slightly small eye development. Shown at BAS 2007. It is difficult to breed moors to the standard and to achieve good colour, shape, finnage and eye development all in one fish. Common deviations from the standard include bronzing on the belly and short, rounded contours in the paired fins, in that the standard calls for long, pointed fins on the underside (as in the veiltail) and an overall dark matt black colour. 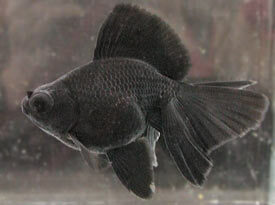 Breeders tend to find that as they develop the veiltail body shape and finnage they lose the large eye size so common in oriental globe eyes. Occasionally, individuals are seen with a red trailing edge to the caudal fin (i.e. 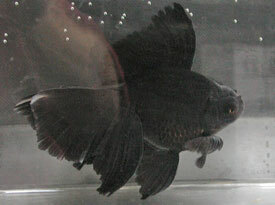 the tail); this is very fetching, but such fish are downpointed at shows. However, it is from such 'sports' that new strains arise and can gain popularity (such as the black and white panda).